The Bible is full of miracles, from Genesis to Revelation. From the parting of the Red Sea, to the raising of Lazarus, to Jesus’ resurrection—there’s no shortage of the spectacular recorded in the Scriptures. Regardless of our perspective and biases, we have to process the testimony of miracles. Truth be told, most of us tend to be spiritual Missourians when it comes to the supernatural. We may have no qualms about praying for God to grant a miracle, but when someone actually claims to have experienced one we get edgy and uncomfortable. C.S. Lewis took on the topic in Miracles, his treatise on the subject. As noted in a previous post, I’ve always had trouble with C.S. Lewis. Miracles is 309 pages long, written in Lewis’ indomitable hold-on-tightly-to-your-mortarboard style. I can’t read it straight through. But…a new tool can help. Like many of you, I have learned to enjoy reading on an iPad. I use the Kindle Reader app, which also lets me read the books I purchase on any Internet browser, even on my iPhone. But now there is an easier way to ‘read’—just listen. Really. Audible is a new app that integrates your Amazon book purchases with your Kindle Reader apps, using a new technology called Whispersync. Audible reads the book to you, and when you switch to the text Kindle Reader picks up where Audible let off, and vice versa. I gave it a road test—expecting a mechanical reading voice but hoping it would turn those long commutes into useful study time. I downloaded the Audible app on my iPhone, bought the Kindle version of Miracles on Amazon.com for $8.99 (just click on the Book image above), then purchsed the narration from Amazon for $3.99. The technology worked flawlessly. It was fantastic. The reading of Lewis’ Miracles was done by professional narrator Simon Vance, who had an Oxford-like accent reminiscent of Lewis’ voice (I imagined). The Audible app was extremely simple and straightforward to use, even allowing me to bookmark key passages on the iPhone. I got through the whole book in six commutes, repeating several of the more challenging chapters. The quality of Simon Vance’s narration was so very good. If you haven’t tried the Audible app, I would STRONGLY encourage you to put it in your discipleship toolbox. Even if you’re just kicking back in your favorite study chair, it can put a turbocharger on your personal discipleship engine. Just imagine being able to fly through tremendous amounts of great reading with minimal effort. Try it, please. Lewis takes 309 pages to eloquenlty make the point that miracles are possible, logical, even necessary. If you have a bit of an appetite for intellectual Christianity, Miracles should be on your reading list. If you’re interested in trying audio books, here’s a list of available titles at the Apologetics 315 website. Me? I don’t see an angel behind every bush. But there is an incredible amount that we cannot comprehend or even imagine about what comprises ‘reality’. God created an amazing, amazing world full of wonders. We take that creation for granted every day. To really explain all the parts and proceses involved right now—even as you read and contemplate this post—quickly gets beyond our understanding of everyday metaphysics. Have I ever experienced a miracle? My answer might make most of you uncomfortable. But I owe it to God who granted my prayer. Yes. This entry was posted on Tuesday, April 2nd, 2013 at 9:55 pm	and tagged with Audible App, C.S. Lewis, Christianity, Doctrine, Miracles, Personal Discipleship, theology, veracity and posted in Tools. You can follow any responses to this entry through the RSS 2.0 feed. 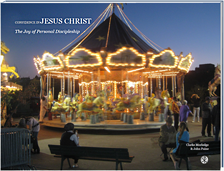 Christian Audio has a number of audiobooks designed specifically for Christian readers. Though not as slick as the AudibleApp, you can get MP3 files that you can download to your SmartPhone, iPod, or computer, using something like iTunes or another MP3 player. If you are cheap, like me, I would suggest LibriVox. Here you will find the largest collection of audiobooks for works found in the public domain, everything from G.K. Chesterton to the The Bible, and even collections of hymns of the church, many of them sung. LibriVox is a completely volunteer effort. If you have something in the public domain, you might want to consider volunteering yourself as a reader. I love audio books. I use the bus to get back and forth to work. Unfortunately I get motion sick when I read in a vehicle so I started listing to audio books about 7 years ago. And yes, CS Lewis is a lot easier to get through on audio than reading.